Four years ago I began a series of images that came to be through happenstance. In other words, I simply stumbled onto some unlikely situations as they presented themselves to me and I leveraged the photographic opportunity to my creative advantage. Since that serendipitous moment, I have actively sought out similar objects to photograph and so far, I’ve been nicely rewarded with different photographic opportunities. I’m a big fan of taking road trips throughout the United States (something my father inflicted me with at an early age!) and these trips target my found American cultural objects. The thing is, these pop cultural objects are incongruous with their surroundings or sometimes just life in general. Americans seem infatuated with the notion that “bigger is better” and thus construct these larger-than-life edifices to commemorate this “bigness”. 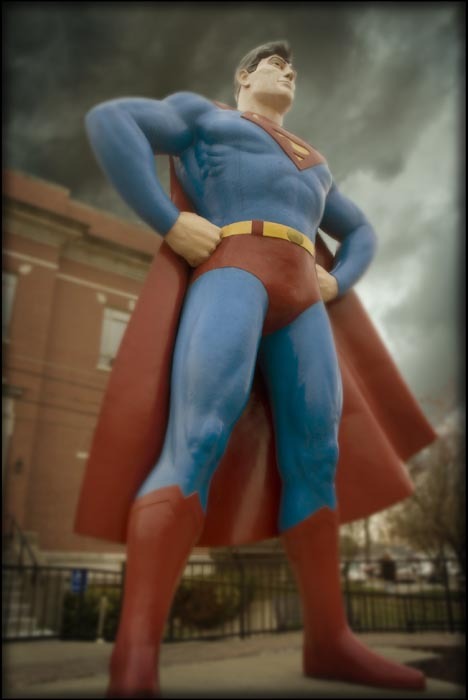 On a recent trip to Nashville, home of the Grand Ole Opry, I intentionally detoured my road trip to the small Ohio River town of Metropolis, Illinois, home of America’s number one super hero—Superman. I’ve been here numerous times with my folks when I was a kid and had not been back in nearly 40 years, so I was very happy to see Superman still stood next to the court house. 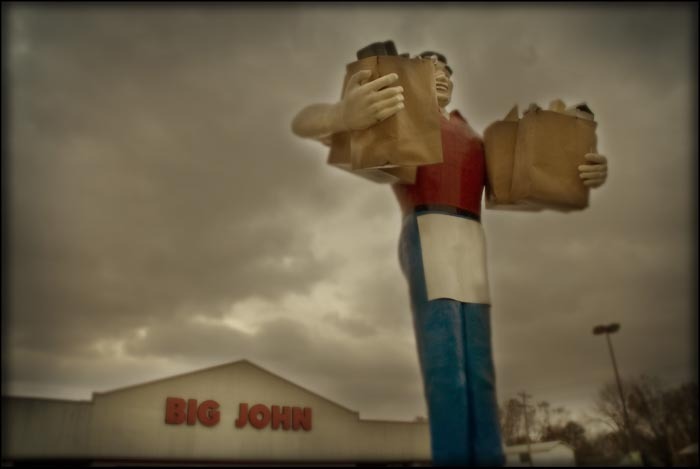 But to my surprise, I found another giant in town, Big John, standing vigilantly outside the Big John grocery store. What a deal…two giants for the price of one! Superman, © 2008, Terry Ownby.